Caves: Cayetana, that's a cool name! Where does it come from? Cayetana: We named our band after a good friend of ours, Cayetano, because he's an awesome dude and a fantastic artist. Caves: If Cayetana were breakfast, what would be on my plate? Cayetana: Tofu scramble, potatoes and bacon. Caves: Who in the band is most likely to break a bone? Caves: Land a plane in the event of the pilot passing out? Cayetana: Augusta and Allegra would end up in jail together. Caves: What are your karaoke songs? Caves: When did you realise you wanted to be rock stars? And what career paths would you have chosen if music didn't exist? Cayetana: We've always wanted to do this, since we were babies. Augusta would have been an assassin, Allegra would've traveled the world with the Renaissance Faire, and Kelly would be a professional vagabond. Caves: Is there a band (past or present) you want to play with more than anyone else? Cayetana: Joe Strummer and the Mescaleros, Joy Division, No Doubt. Caves: If y'all were captured by some bad wizard jerk who was threatening to transform you into an animal of your choosing, what would it be and why? Cayetana: Augusta would be a seahorse so she could float around and never get pregnant, Allegra would be a bird of paradise, and Kelly would be a snapping turtle-- although she's always wanted to be a really fluffy animal so she could sleep on her own skin. Caves: Can you sum up Cayetana with a haiku or a short rhyme? 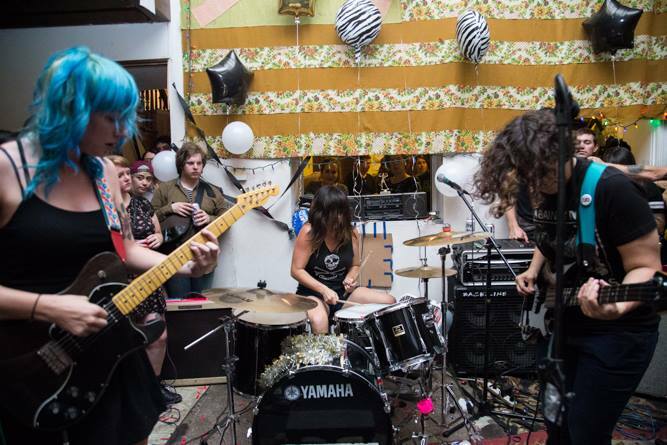 Cayetana: 4 hours of talk/ 1 hour of rock/ around the clock...? Caves: Are you coming to the UK soon? Scene Point Blank: What was your favorite experience at Fest 12, from a band perspective? Cayetana: Our favorite experience as a band was playing for the first time and being surrounded by so many friends and musicians we love, and getting to take part in this community in a different way. Scene Point Blank: What was your favorite experience at Fest 13, from a fan’s perspective? Cayetana: Watching our friends from Philly do so well in a different city. Scene Point Blank: Did you catch Caves’ set last year? What was your strongest memory? Cayetana: Yes! It was awesome. We enjoyed watching Lou shred Augusta's guitar. Scene Point Blank: Is there such a thing as too much PBR at Fest? 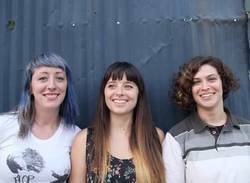 Cayetana: Maybe. Ask Augusta about her epic hangover. Words by the SPB team on Nov. 12, 2014, 3:15 p.m.
Main photo by Mary Ferrigno. Inner photo by Rachel Del Sordo. Posted on Nov. 12, 2014, 3:15 p.m.
Posted May 7, 2017, 12:46 p.m.
Posted April 10, 2017, 5:43 a.m.
Posted Feb. 23, 2017, 8:26 a.m.
Posted Nov. 12, 2014, 3:21 p.m.